It is not known where Godfrey Nims was born nor his birth date. It has been speculated that he may have been a Hugenot (French Protestant) and arrived in America at a young age and that his name may possibly have been Godefroi de Nismes, changed to Godrey Nims. The first official recorded mention of Godfrey Nims is in a Springfield Massachusetts court record dated September 24, 1667 and referred to below. He died in 1705. Godfrey Nims settled in Deerfield, Massachusetts around 1670, was married twice, had 11 children and 4 stepchildren. Godfrey Nims was the father of Abigail Nims. Abigail was a survivor of the 1704 Deerfield Massacre where at age 4 she was captured and taken to Quebec, Canada where she remained for the rest of her life. She was renamed Elisabeth Nims in 1713 by the Catholic Mission, Quebec, Canada, which name she used for the remainder of her life. At the age of 15 she married Josiah Rising (renamed Ignace Raizenne in 1713 by the Catholic Mission, Quebec, Canada), also a survivor of the Deerfield Massacre. Abigail and Josiah were both adopted and raised by the Kanienkehaka (Mohawk) in Kahwawake, Quebec from 1704 until 1713 when they were released and placed in the Catholic Mission. Abigail was given the name T’atog’ach and Josiah was given the name Shoentak'ani by the Kanienkehaka (Mohawk) during the years they lived with them from 1704-1713. When they married they chose to live in Oka, Quebec close to their adoptive family. They built a home on land which the Sulpician priests provided to them. Abigail 's granddaughter, Elizabeth Sequin married Antoine Quesnel, Arthur Quesnel’s great grandfather. Eunice and Abigail were 2 of the 7 girls who were captured from Deerfield during the 1704 massacre, taken to Quebec, adopted and raised by the Kanienkehaka (Mohawk). The following information is copy/pasted from The Nims Family Association website. Check their site out for much more! Regardless of his birthplace, the first official record of Godfrey Nims appears on September 24, 1667, in a Springfield, Massachusetts court record. "James Bennet, Godfrey Nims & Benoni Stebbins, young lads of Northampton being by Northampton Commissionrs bound ouer to this Corte to answer for diverse crimes & misdemeanrs comitted by them, were brought to this Corte by ye Constable of yt Towne wch 3 lads are accused by Robert Bartlett for that they gott into his house two Sabbath dayes when all the family were at the Publike Meeting: On ye first of wch tymes, they vizt. 24 shillings in silver & 7s in Wampum with the intention to run away to the ffrench: Al which is by them confessed, wch wickedness of theires hath also been accompanyd with frequent lying to excuse & justify themselves especially on Nims his pt, who it seemes hath been a ringleader in their vilainys: ffor all wch their crimes and misdemeanors this Corte doth Judge yt the said 3 lads shalbe well whipt on their naked bodys vizt, Nims & Bennet with 15 lashes apeece & Bononi Stebbins with 11 lashes. And the said Nims & Stebbins are to pay Robert Bartlett the summe of 4L being counted treble according to law for what goods he hath lost by their meanes. " Archival records of Massachusetts list Godfrey Nims as one of many from Northampton who signed a petition in 1668 requesting relief from taxation on goods brought into the colony's ports. He also appears with others when taking the Oath of Fidelity to the government on March 25, 1672/3, at the County Court at Northampton. Again, family tradition tells us that Godfrey soon came to Deerfield, Massachusetts around 1670, perhaps as early as the third settler. A deed dated 1679 gives the first written indication that Godfrey settled at Deerfield, where he later shared in the holding of public offices, including constable, tax collector, selectman, and later, as a member of the school committee. The present White Church, town office, town hall, and Memorial Hall all stand on land formerly owned by Godfrey. J. R. Trumbull's History of Northampton, Massachusetts describes Godfrey as "the owner of considerable property and...an honored and respected citizen." In 1677, Godfrey married Mary Miller Williams, widow of Zebediah Williams who had been killed earlier by Indians. Following the death of Mary in 1688, Godfrey married Mehitable Smead Hull in 1692, widow of Jeremiah Hull. He had six children with Mary and five with Mehitable, in addition to caring for two stepchildren each that the widows brought to the marriages. As the records demonstrate, Godfrey Nims joined the Puritan society in the Connecticut Valley, learned to make his living as a cordwainer (shoemaker) as well as a farmer, and raised a large family. Like other settlers, he shared the work and faced tragedies and dangers common to the area. The greatest blow came on February 29, 1704, when about 2 hours before day "ye French & Indian enemy made an attaque upon Derefield, entering ye Fort with Little discovery though it is sd ye watch shot of a gun & cryed Arm, weth verry few heard." The attackers burned most buildings and killed or took captive most of the settlers. Godfrey died within a year, and it is from the four surviving children, John, Ebenezer, Thankful and Abigail, that members of the Nims family are descended. Mary Williams, b. December 24, 1673. Godfrey's stepdaughter later married Nathanial Brooks in 1695 at Deerfield. Nathanial, Mary, and two young children were all captured in the 1704 raid. Nathanial later was redeemed; the fate of the two children is unknown. Mary Williams Brooks, on the 8th day of the forced march, relayed that she had been "disabled by a fall on the ice, causing a miscarriage during the night. I will not be able to travel far, and I know they will kill me today." Speaking with her minister, also one of the captives, she asked, "Pray for me that God would take me to himself." They parted and she went calmly to certain death, March 7, 1704. Zebediah Williams, b. 1675; captured by Indians with stepbrother John Nims on October 8, 1703. Died a captive in Canada on April 12, 1706. Rebecca Nims, b. August 12, 1678; died August 30, 1678. John Nims, b. August 14, 1679; captured by Indians October 8, 1703, and escaped from Canada in 1705. Married his step-sister Elizabeth Hull on December 19, 1707. He died December 29, 1762. Rebecca Nims, b. August 14, 1679, a twin of John. Married Philip Mattoon January 15, 1702/3. She was killed in the 1704 raid on Deerfield, age 24. Philip was captured and died on the forced march to Canada. Henry Nims, b. April 29, 1682; killed in 1704 at Deerfield, age 22. Thankful Nims, b. August 29, 1684; married Benjamin Munn January 15, 1702/3; d. July 11, 1746. Ebenezer Nims, b. March 14, 1686/7; captured and taken to Canada in the 1704 raid; redeemed in 1714; returned to Deerfield with fellow captive and wife Sarah Hoyt. Elizabeth Hull, b. December 23, 1688; married step-brother John Nims as noted above; d. September 21, 1754. Jeremiah Hull, b. January 15, 1690; burned to death in the house of his father Nims, when that home was destroyed by fire, January 4, 1693/4. Thomas Nims, b. November 6, 1693; d. at the age of three, September 10, 1697. Mehitable Nims, b. May 16, 1696; killed in 1704 at Deerfield, age 7. Mary Nims, b. February 28, 1698/9; killed in 1704 at Deerfield, age 5. Mercy Nims, b. February 28, 1698/9; a twin of Mary, also killed in 1704 at Deerfield, age 5. Note the toll of Godfrey's family members killed or taken captive in the 1704 raid on Deerfield: his second wife captured, dying on the forced march to Canada. One son killed, and one captured, to be redeemed ten years later; four daughters killed that day; one daughter captured and taken to Canada, never to return. A step-daughter, Mary Williams Brooks, and a son-in-law, Phillip Mattoon, captured and killed on the march; a grandchild, infant Mattoon, killed in the attack. Earlier in 1703, a son and stepson captured and taken to Canada, where one escaped and the other died captive. One might well imagine the burden of these tragedies contributing to Godfrey's death sometime early in 1705. 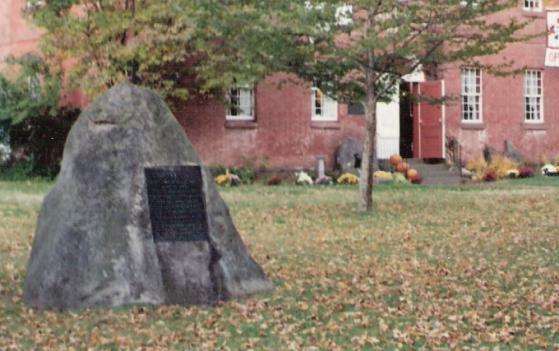 Godfrey Nims boulder in front of Memorial Hall, formerly a Deerfield Academy building.